Following the advice by my pundit Ndubuisi Ekekwe on Linkedin, I prepared an article on my prowess in embedded and IoT system design. And I asked for his opinion, to my surprise, he gave me this platform to express myself, for which I am very grateful. I will use this platform to share two of my major projects. My insight and interest in embedded systems became profound in my final year degree project, where I had the opportunity to work in a team of three students on the design and implementation of LED-based electronic notice board controlled wirelessly using a smartphone. The objective was to reduce the environmental and economic waste caused by using the traditional paper notice board, especially in the electronic engineering department. I was responsible for designing the 512 pixels dot matrix display screen and the control panel on Proteus software, through-hole soldering of components and programming the Arduino Nano microcontroller boards using C.
We encountered a major challenge in configuring one Bluetooth module to receive information from the smartphone and transmit it to two different microcontrollers used in the project. But through perseverance, we overcame our challenges and received a grade of A on project defence day and came second at the Young Innovators Regional Workshop organized by the Innovation Centre at the University of Nigeria, Nsukka (UNN). This project showed me the intrigues of how things work beyond text and classroom knowledge. 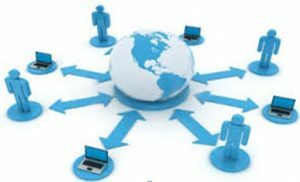 Technological advancements and globalization have paved the way for a world controlled by information and communication technology. Information dissemination (to distribute or broadcast information) is an essential part of the 21st Century society. Among other methods of disseminating information, the mass media is a sure method for reaching the public with information. The mass media provide indirect, one-way communication where a large number of people can be reached without personal contact. This category (mass media) is clearly where a notice board belongs. Traditional notice boards are relatively cheap and fairly easy to use but they become very uneconomical in the long run as papers and pins are constantly purchased to keep it running. Also, after a while, information on these papers becomes redundant and they have to be removed from the board constituting solid waste causing environmental pollution. The world is fast changing to the use of electronics to solve problems and reduce human stress encountered in the use of traditional and crude equipment and the notice board a vital tool of mass media cannot remain in its traditional and crude form. Hence, the need for an interactive electronic notice board controlled using Bluetooth technology. With an interactive electronic notice board, information can be disseminated at the push of a button and from a distance. The messages will be more visible, clear and contribute to the aesthetics of the environment. Unlike the traditional notice board, no solid waste is generated. In this project, an interactive electronic notice board is designed and constructed. Traditional notice boards make use of written or printed information on paper. The information on them after a while becomes irrelevant and has to be changed causing environmental pollution as the paper will constitute solid waste and changing of the information becomes costly on the long run – purchasing paper, pins and printing cost. Also, electronic notice boards (especially in our locality-Nsukka) are not interactive, that is information on them cannot be changed once they are programmed on the chip, this limits their use and relevance. To restrict the change of information on the board to authorized users. To reduce the use of print media in disseminating information in public places. To wirelessly change and control the message on electronic notice board quickly and easily. To design a digital clock that would be attached to the board. A 512 LED dot matrix (i.e. eight 8×8) pixel mono-colour display screen. The board will be able to display 250 characters per message. Developing a display screen using Led dot matrix and display drivers to show the information contained in the microcontroller. Using a wireless input device that will send information to the microcontroller via an interfaced wireless module. Developing a digital clock and calendar that will display the time and date held by the Real Time Clock (RTC). Developing a computer program that runs on the microcontroller to control the system. At the heart of the interactive electronic notice board is the Arduino Nano microcontroller board, which is programmed using Arduino C language to receive, manipulate, and convey signals to peripheral components and modules in the system. As an interactive system, the notice board is equipped with a Bluetooth module (HC-06) which uses the Universal asynchronous receiver/transmitter communication protocol which allows for full duplex communication in its operation. HC-06 receives signals in form of messages typed on the user’s Android device and transmits same to the microcontroller on the Arduino board. The microcontroller receives these signals, interprets it and determine through the embedded code, which data is meant for the scrollable display, digital clock or which is a command to adjust specific properties such as speed, brightness, set time/date etc. 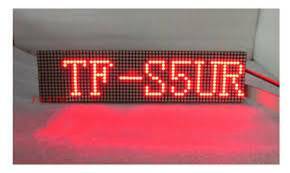 Message signals are transmitted to an array of 8×8 LED Dot matrix modules (forming 512 pixels display screen) through LED drivers (MAX7219). MAX7219 works using the SPI communication protocol, the microcontroller utilizes the precise clocking protocol of the MAX7219 to select the right slave device (here LED Dot matrix) for a particular signal per time. This causes the right LEDs needed to form the desired character(s) to lit up per time at a scan rate of between 500-1300 Hz, and by the persistence of vision, we tend to see a scrolling message. Special controls have been added via code for the user to adjust the speed of the scrolling message as appropriate for the event, environment and use. The digital clock aspect works using the precise DS1307 Real Time Clock (RTC) module to get the time/date using the 12C transmission protocol. Here, the microcontroller acting as the master uses the SDA and SCL (2-wire bus system) to get the time/date from the DS1307 and when necessary, to set the time/date on the DS1307.The microcontroller again uses the MAX7219 to convey the correct time/date to the seven segment display which displays the right time and date on the notice board. The display circuit is first designed and simulated on Proteus design suite. This is important to help confirm circuit designs before physical implementation to avoid failure of electronic components. 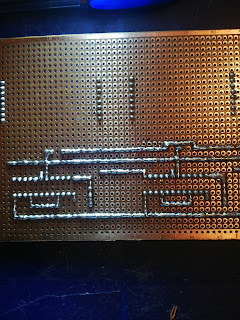 After confirming the circuit design on Proteus, through-hole soldering of electronic components is done as shown below. With the soldering completed, the sub-systems are connected together using Ribbon cables. Sub-system method of design is necessary to aid in troubleshooting and replacement of damaged components/modules if need be. Hurray!!! we are home and dry as each sub-system works properly. 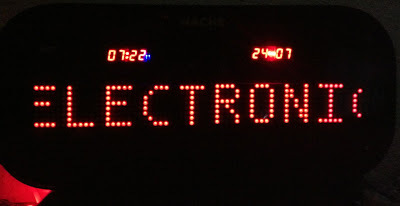 The displayed time is 7:22 pm (blue light on), the date is 24th, July (2016) and the message sent to interactive e-Notice board ” ELECTRONIC ENGINEERING DEPARTMENT” is scrolling by. The interactive e-Notice board is housed in a package made of carbon fibre reinforced plastic for strength and durability. The LED display notice board is a technology that has so many applications like in banks, church, hospitals, airports etc. 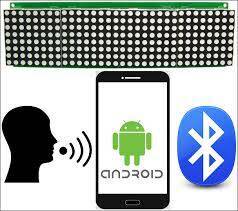 Speech to Text conversion: This application will enable users of the board to speak through the phone and get the speech information converted to text form. The text is then sent through the Bluetooth to display on the board. Doubling the Dot Matrix: By doubling the dot matrix, the information on the e-Notice board can be viewed from a far distance. 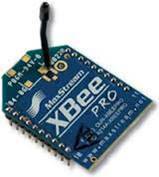 Using Zigbee Connection: Using a Zigbee or Wi-Fi module will enable messages to be sent to the e-Notice board from a longer range. This will also make it easier to network many e-Notice boards. B) A smart-farm project using embedded systems and IoT (Internet of Things) technologies. I am currently working on a smart-farm project using embedded systems and IoT (Internet of Things) technologies to collect data about farmland conditions (moisture, PH, temperature/humidity, UV rays, etc. ), and send these data through an internet gateway for analysis to help predict and forestall crop diseases in other to improve farmland productivity. Currently, the Global Hunger Index for Nigeria is 25.5, with a rank of 84 out the 119 countries ranked.Also, UNICEF 2016 hunger statistics indicate that 12.9 million Nigerians are HUNGRY. Now, 12.9 million might seem insignificant in a nation with about 193 million people, but 12.9 million is approximately the population size of Singapore, Finland and Botswana combined together. If the numbers are these bad, you can imagine what the real figures are. As the saying goes, A Hungry man is an Angry Man. And hungry people can’t think well, let alone develop. One of the main causes of Hunger is low agricultural productivity. The price of crude oil is capricious which contributed to the recent recession experienced. So, the government is making efforts to diversify the economy by going into agriculture. Apart from corruption in the system, there is another problem; we have too few people involved in agriculture to provide the amount of food needed for food security and for export. The problem might be obvious; agriculture is considered out-dated by the youths, and considerably strenuous in this era of “smart things “. Simply put, agriculture is unattractive. We need to change the tide and make it super attractive. As an IoT( Internet of Things or Internet of everyThing as I like to call it) enthusiast, to make agriculture comely, we ought to make it “smart” by the use of embedded systems, data analysis and the power of the internet to fully automate the agricultural industry. This will also make farmers proactive, for example, a farmer can know by the push of a button the conditions of his/her crop and take measures to stop hazards even before they occur (farm forecasting). Hence, increasing agricultural productivity. But to what extent will be determined by other factors like if the fertilizers will reach the farmer on the farm. The pith anyway is that “smart agriculture” is crucial to eradicate Hunger in Nigeria and boost our economy via export of farm proceeds. Else, whenever the price of crude oil goes below expectations, we go to negative GDP aka recession. Using the ESP8266 Wi-Fi capability, a sensor mesh network communicates to a central station in the farm that is equipped with Arduino UNO and SIM900 GSM module. 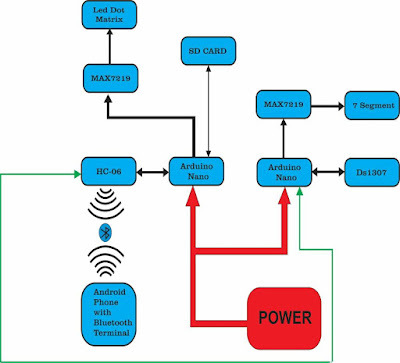 The GSM module enables this project to be classified as an IoT project, as its GPRS capability is used to push data online using the MQTT (Message Queuing Telemetry Transport) protocol. With the help of the MQTT protocol, the central station in the farm can publish data from sensors to an MQTT web broker. This will enable a Website and mobile app client subscribers to get data for the sensor topics they have subscribed to. The user/analyst then makes use of the Website/app tools to transform this data into useful information about the welfare of crops, make timely predictions to help the farmer in the farm improve productivity and farm yield. This project can easily be extended to perform other functions, for example, if the sensors and actuators are replaced as desired, an IoT based home automation system can be created. Your comments and questions are welcomed!!! I am an embedded and IoT system developer, I find fulfilment reconciling software with hardware to control the physical world. I have been silently learning from your posts!!! thank you for this platform prof.
Nice one henry. Your current project is promising, but seeing that most of our farmers are not too educated, I wonder how they will use it. It will be good for extension officers though.